But there is good news on the horizon, and on the shelves of your local 7-Eleven. It’s called Drank, and it claims to be an anti-energy drink. The slogan is “Slow your roll.” Drank is everything you would ever expect from a drink that called itself an anti-energy drink and an extreme relaxation beverage. I grew up in Austin and Houston. In Houston, rap music is huge. I remember the first day that 97.9 The Box went on the air. Ah, memories. I still listen to rap music here and there. As recently as a few days ago, I was familiar with purple drank because several prominent hip hop musicians and famous rappers have referenced the drink in several hit rap songs. In those songs, purple drank is also referred to as sizzurp, lean, syrup, drank, barre and purple jelly. What I did not know was that a brand of anti-energy drinks had actually been created. Think about it: Most Americans are pumped to the max on sugar. Everyone’s got ADD at some level. We want it our way, right away. We crave drama. And all of that leads to us being tired and exhausted. The logical evolution of beverages would be the creation of sugary drinks that give you more energy to deal with your day. That is why the energy drink market has surged over the past decade. But with Purple Drank, we have a drink that actually relaxes you. It slows you down. It’s meant to decreases your nervousness and anxiety levels, so you can just chill out a little. From what I know, Houston has been celebrating a slowed down lifestyle for a long time. You can hear this in the chopped and screwed music that’s been playing in Houston for the past 20 years. You can see this if you go out on a Sunday night and see people cruising down Richmond Ave at slow speeds. People down there love the slowed down lifestyle. And why not? It’s probably not any worse than being high strung, anxious and exhausted all of the time. Houston, Texas producer DJ Screw first popularized the concoction, which is widely attributed as a source of inspiration for the “chopped and screwed” style of hip hop music. Originally, the active ingredient of “syrup” was cough syrup containing promethazine and codeine. The concoction first gained popularity in the underground Houston rap scene and later spread to other southern states. In June 2000, Three 6 Mafia’s single “Sippin’ on Some Syrup,” featuring UGK brought the term “purple drank” to a nationwide audience. 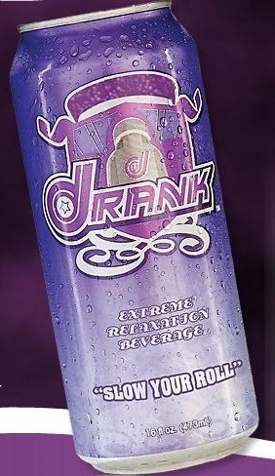 Three 6 Mafia’s single “Rainbow Colors” featuring Lil’ Flip pertains to the consumption of purple drank; the addition of a Jolly Rancher candy to a cup of purple drank creates a spectrum of colors, hence the name. “Rainbow colors” can also refer to a mix of different narcotic cough syrups containing codeine, hydrocodone, and various other anti-histamines, expectorants, and such. So-called “yellow syrup” is a blend of XR hydrocodone and atropine or chlorpheniramine and “pink syrup” is Cheratussin AC brand codeine and guaifenesin. Cheratussin AC (and other similar brands), which is legal for over-the-counter purchase in some states (e.g., Washington), is sometimes seen as an alternative to purple and yellow syrup. That is the story of Purple Drank. I hope you found all of that very enlightening. If you don’t know about purple drank, you are really missing out on a huge cultural phenomenon that originated in the southern United States. And just a word to the wise: do not abuse prescription-strength cough syrup. Codeine, which is found in prescription-strength cough syrup, was likely a big factor in the deaths of DJ Screw, Big Moe and Pimp C. Just thought you should know that.